I got this recipe from Diana, my co-worker. She's shared these enchiladas with us a few times at work on "Smörgåsbord" Wednesdays which basically boils down to a lovely feast of assorted dinner leftovers from everyone. 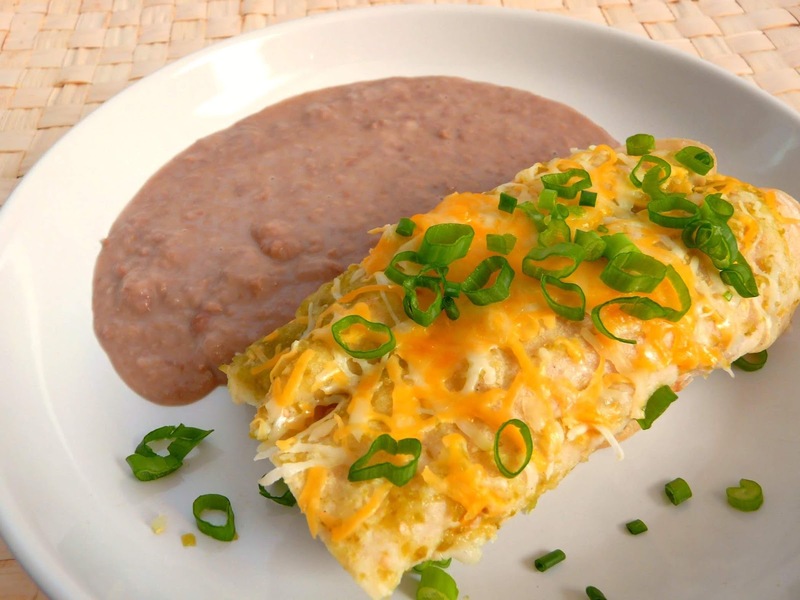 What I like about her enchiladas is its simplicity. They're filled with only a handful of ingredients but taste so light and flavorful. I finally emailed her for the recipe one day and she sent back a description of what ingredients she uses plus a brief rundown on what she does. There weren't any measurements or specifics but I was confident hoping I could wing it. The green sauce is made from tomatillos and jalapeno peppers. I had once used tomatillos in a salsa recipe years ago but have since forgotten how cute they are. First looks can be deceiving. They come wrapped in rough, ugly husks. However, when you tear them open, the little tomatoes reveal themselves in all their bright green and shiny glory. Such perfect little gifts from Mother Nature. Tomato and onion filling on left, green sauce on right. Fill and roll. Easy peasy. Start off by first poaching the chicken. To do that, add the chicken breasts, frozen or not, to a pot of lightly salted water. Bring it to a rolling boil then turn the heat down and simmer on low heat, covered, for about 20 minutes or until the chicken is fully cooked and no longer pink inside. Remove the chicken from the pot and transfer to a dish. Once the chicken has cooled, shred it and set aside. Next, heat about 2 tablespoons of oil in pan. Saute the garlic and onion until fragrant then add the chopped tomatoes. Once the tomatoes have cooked down, remove from heat and transfer the mixture to a dish and set aside. 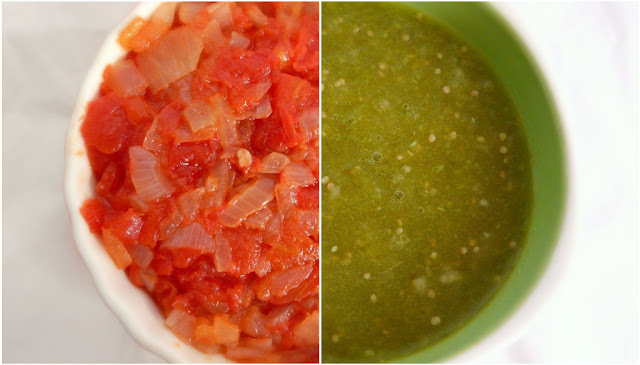 For the green sauce, boil the whole tomatillos and jalapenos together in a pot of water for about 5 minutes. Drain them and transfer to a blender or food processor. Add the cilantro and pulse everything together until you get a sauce mixture. Salt to taste. Fry the tortillas in a little oil to soften them up. Then either dip the tortilla in the sauce or just spread some of the sauce on the tortilla with the back of a spoon. Fill it with the shredded chicken and tomato and onion mixture then roll the tortilla into a cigar shape and place in a large baking dish with the seam side down. Repeat until all the tortillas are filled. Spoon more sauce over the enchiladas and top with shredded cheese. Bake for about 15 minutes or until the cheese has melted. Garnish with chopped green onion and serve immediately. The enchiladas were served alongside refried beans, corn chips and homemade salsa. And no, Bud Light was not my beer of choice (I'm a Corona fan) but since I had some leftover from a party, I figured I might as well have one with a squeeze of lime. I'll admit, I didn't make quite enough green sauce to drench everything (this is where Tapatio sauce comes in handy) but the family still thought it tasted pretty good. No leftovers!